UPC vs. QR Code [Hot Stuff]. back home » Hot Stuff » Universal Product Code vs. QR Code. While Bar Code is for commercial uses only [Not Freeware]. The new to public QR-Code could be used as desire, and it's for free [Private and Commercial uses]. Learn to use QR-Code for all purposes, and boost your business quickly. It's too hot to handle. Be the first to get the hottest information, get to know the differences between the standard Universal Product Code [Bar Code] and the new QR-Code. Being highly informative will earn you more than your competitors. This's too hot to handle. Universal Product Code [UPC] Or Bar Code. Surely, everyone knows about the standard Universal Product Code [UPC], used on products we by in shops everyday. Nearly every item you'll purchase, being it a Car, Food stuff, Dresses, Electronics, Tickets, Books, etc, they all having the UPC Bar Code on them, for identification and sales purposes. The UPC code is always containing the product's information, like Article number, Name, Product Type, Manufacture, Price and so on. And is defined as solid stripes with something like a serial number underneath. [See Image on the left]. Putting it in the simplest way, UPC [Bar Code] is a price tag, and when scanned, this will reveal the price of the product holding it. This speeds up the checkout process in every shop. UPC a.ka. Bar Code is used only on commercial basis. Read more on Wikipedia. The newest technology is called QR-Code, and it's used to digitize every information, from URLs to SMS, and phone numbers. QR-Code is scanned with smartphones using Apps like QR-Code Reader. It's mostly the smartest way visiting a mobile website, storing information, and performing promotions. What Is A QR-Code? [Quick Respond Code]. QR-Code [Quick Response Code] is a two-dimensional Bar Code, first designed by Toyota subsidiary Denso Wave, for the automotive industry in 1994 to track vehicles during the manufacturing process. Today, QR-Code is for free, you can simply generate one and place it on your website, blog, letter heads, complimentary cards and so on. It's the most easiest and effective way of reaching out to your audience out there, bringing them to whatever you'll be promoting without stress. It has a very fast readability potentials, large storage capacity, and it's very easy to use. How To Create A QR-Code. You'll first have to find a QR-Code generator. There are many of them on the internet for free and very simple to use. 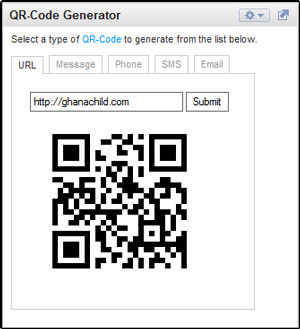 Below is a list of some powerful QR-Code Generators you can use for free. Making it easy for me to create my QR-Codes when needed, I've simply added the Google QR-Code generator to I-google. To use the Google QR-Code generator follow the steps below. Click on any of the tabs to select the type of QR-Code to be generated - See Image. Right click on the generated image and choose Save Image As in the context menu. Rename and save image in to your images folder, so you can from there on add the generated image into all printing media, websites, blogs, social platforms and more. What Is the Benefit Of A QR-Code. Spreading your QR-Code on everything possible, makes it easier for mobile user to track advertising or any information within without hassle. For example, tipping a website's URL on a smartphone is a task that needs a great will. Scanning a QR-Code to visit a website takes away users' stress. This helps to boost up mobile traffic that visits your website or Blog, expanding the conversion rate of your marketing. Using QR-Code for promotions will also save you a lot of money in your advertising processes, simply because, one time printing of promotion materials with QR-Code on them, can serve another by simply changing the destination link used for the QR-Code. You can also create a compressed message, Email, SMS, Phone Book, and more as a single image and save as a back up, or send it out. How To Create And Read QR-Code. To read a QR-Code, first download and install a QR-Code Reader [App], onto your smartphone, turning it into a QR-Code scanner. You can then use the App to scan and decode any QR-Code you'll see. If the QR-Code is coded with a URL it will immediately send you to that location, or give you a button link to press on, loading the site page. 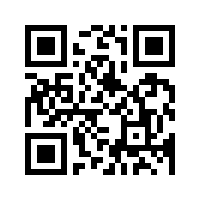 Below are links to download QR-Code Readers. Create And Use QR-Code Video. Outdated And Still Burning Hot.